E-SENIORS is "ASSOCIATE" partner in the EIT Health (European Institute of Innovation and Technology) community. EIT Health is one of the largest healthcare initiatives worldwide. Its goal is to sustainably advance the foundations of healthcare and thus promote the future conditions for healthier living and wellbeing of people across Europe. EIT Health is leveraging the expertise of more than 130 leading organisations spanning key areas of healthcare such as Pharma, MedTech, Payers, Research Institutions and Universities. Chosen by the European Institute of Innovation and Technology (EIT) to form EIT Health, the consortium offers best-in-class research capabilities, higher education and business expertise. With a budget of 2 billion EUR over the next decade, it will purposefully invest in Europe’s best entrepreneurial talents and creative minds to foster the development and commercialisation of smart product and service solutions in the health sector, addressing the challenges imposed by demographic change and ageing societies. 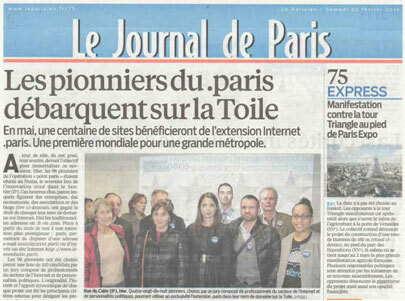 E-Seniors association was selected among the 100 pioneers of ".paris / dotParis". Therefore we decided to offer to all wired Parisian/ French/ expats / tourists seniors a website where they will discover all the "must" addresses for daily life, active aging, ambient assisted living as well for health as for leisure. This website is interactive and we propose to inform about the new "creations" and ideas that may interest out target population. We invite structures / startups that have innovative projects in the field of health and active aging to be in contact with us and we publicize about their offers. As digital world is expanding and playing a growing part in our existence it remains primarily adapted and oriented to younger generations. Older people find themselves increasingly isolated as more services, information and activities become transformed into a digital format, being more distant and non personal. Governments continue to invest in the development of broadband infrastructures supporting the expending use of the internet. They also try to encourage the training of users within different sub-populations, but excluded populations continue to grow as a result of factors not necessarily taken into account initially, such as ageing and immigration. Comparing the situation in European countries, one can identify a wide variation in the ages of dependency onset as well as in the level of inclusion/exclusion of older people in digital life, their capacity to identify opportunities and benefit from them. This project proposes to create a community/network bringing together players in the field of Seniors′ ICT Training. This community aims at influencing the development of solidarity and cohesion in the European population. Building on the synergy between its members, this network will stimulate the transfer of knowledge and exchange of best practices as well as working groups to developand promote new ideas and solutions. The impact of such a European Network can be much stronger than any local initiative. Members of the Network will disseminate information in their respective countries ,valorize the network′s work and stimulate further local initiatives providing them a stage for the future development at more extensive levels. E-SENIORS is administrator of the the French Chapter of the Internet Society (ISOC).